Using our websites innovative home search tool will provide you with all the newest information regarding Frisco homes for sale. Frisco is an affluent city in Collin and Denton Counties and a rapidly growing suburb of Dallas. As of the 2010 Census, 116,989 people were living in Frisco. Frisco was the fastest growing city in the United States in 2009, and also the fastest growing city in the nation from 2000-2009. Since 2003, Frisco has received the designation "Tree City USA" by the National Arbor Day Foundation. Frisco has been recognized by Money Magazine as one of the top 100 places to live in the United States. Thanks to affordable housing and a healthy local economy, Frisco was named one of the top places to relocate by Forbes.com in 2009. Like many Dallas suburbs, Frisco is accumulating a tremendous number of retail properties, including Stonebriar Centre, a 165-store regional mall, and IKEA. The city continues to experience consistent growth. Frisco is home to several sporting venues, an NCAA Division I conference, an NHL hockey team, a Major League Soccer team, a minor hockey league and one of its teams, a minor-league baseball team, and most recently added an NBA D-league team. The abundance of area attractions, entertainment and affordable housing make Frisco a very desirable community. 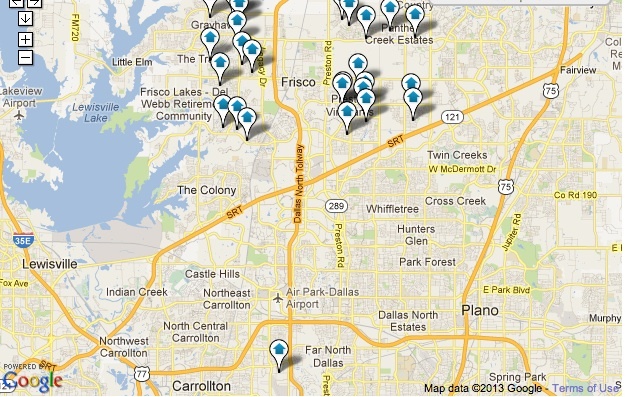 Most of Frisco is a part of the Frisco Independent School District (FISD). Some parts extend into Lewisville Independent School District (LISD), Little Elm Independent School District (LEISD), and Prosper Independent School District (PISD). The Dallas-Fort Worth (DFW) area is rich in higher learning opportunities. DFW enrollment in both public and private four-year institutions is over 125,000. The DFW area is home to five community college districts, several of which offer multiple campuses, enrolling just under 135,000 students. Frisco is home to four satellite university campuses and a Collin County College District campus. Contact an experienced Frisco REALTOR at The Todd Tramonte Home Selling Team can assist you in your Frisco home search.